What are your plans for the week? I hope you’re attending meetings with your clients who said call me back in September? If you haven’t managed to catch up with them yet, today’s the day! It’s the last week of September. Give them a call, or a nudge via email and ask when are they available to talk or meet up. I’ve had some fantastic meetings over the last couple of weeks, one day sticking in my mind in particular. Here’s what happened on Thursday! First off at 11 am, I had a coffee meeting in the RAC building in London, which is an ornately listed building full of character, and surprisingly has a swimming pool! I met up with a lady who is on the Board of the Harvard Alumni and we spoke of women’s challenges that are still there in the corporate world, raising your personal profile to get ahead and I helped tweak her presentation with a few nuggets to make it sing and inspire her audience with her stories. After that it was a full-on Executive Coaching afternoon session in Piccadilly, helping a lady to get clarity on her new direction. At 4 pm I met with a Publisher and introduced her via email to another of my clients as she’s interested in a couple of events for her team! #results all round! At 5 pm, I went to a meeting with a VIP Business Coaching client I’ve been working with for two months so far, to choose her photographs for her new website. She arrived full of energy as she had great news that she had won 2 new clients that morning saying they’d love to work with her and transform their style. (they said yes to the new prices so my client was super pumped!) I’ll keep you posted when we’ve finished the site. After dinner, I walked back to Victoria Station feeling so proud of my day, and totally exhilarated by being with all these amazing women I’d had the privilege to work with, be with, and help, and then to top off what I thought was already an amazing day, I bumped into my friend Jan Meek. I met Jan about six years ago and have been following her amazing journey ever since. This woman is totally inspirational so it was brilliant to bump into her again in Victoria station. It was nearing 10 pm, we were both tired from our day but in high spirits and thrilled to see each other, hence why we’re laughing so hard! So, introducing to you, the amazing Jan Meek, The Polar Maiden who is leading a group of 5 women to the South Pole in December. 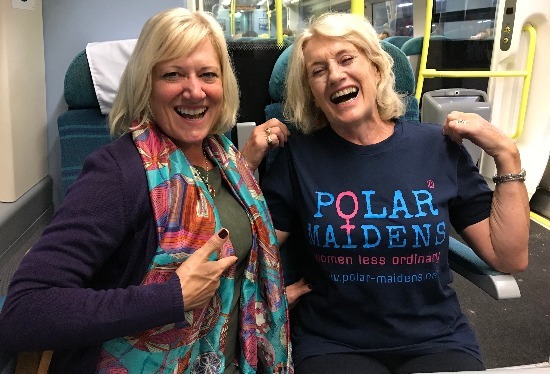 Jan already has 3 World Records for successfully rowing across the Atlantic, reaching the two North Poles, magnetic and geographic, and is now training to go to the South Pole, with her fellow Polar Maidens, as she describes them, women less ordinary. I know, right! And she started all this in her mid-forties! Jan was interviewed by the BBC and hopefully, we’ll be able to follow her expedition in December as she walks for 20 days to the South Pole. OMG!! The woman is incredible. I hope she inspires you too and helps you to step outside your comfort zone? Have a wonderful week ahead and I hope you’ve enjoyed the series of emails for Self-Care September. Q4 is around the corner. Get ready!